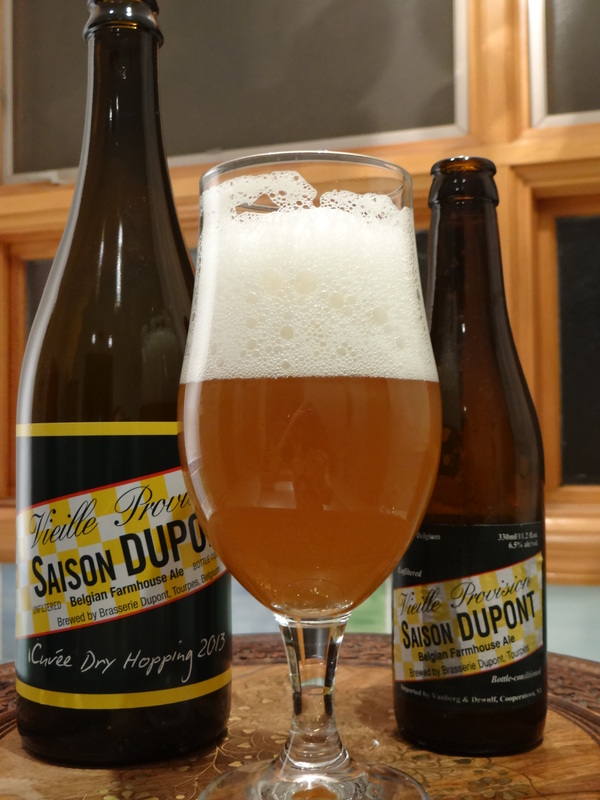 Saison Dupont is the considered to be the quintessential Saison. Here I review the standard Saison Dupont (the small bottle in the picture above) followed by a review on a dry hopped variation on the standard offering (the large bottle). The yeast used to make Saisons is thought to be related to red wine yeast, and the peppery, earthy taste of a Saison pairs very well with many foods. Next time you are entertaining guests you might consider serving this beer in place of wine at the dinner table. When I opened the bottle the carbonation from the bottle conditioning was so high that beer started gushing out the top, which I must say is a bit disconcerting for a beer that is 50 cents an ounce. Once I got it into the glass it yielded a hazy amber colored nectar with a big white head that initially filled almost the entire glass but slowly receded to a thin layer on the surface of the beer. There is quite a bit of sediment in the beer that adds to the haziness. The smell of this beer is fantastic, nice earthy Brett-type funkiness from the yeast and black pepper spiciness. The essence of what a Saison should be. Initially the taste was not exactly what I was expecting. There is a subtle fruitiness, which I’m going to call “juicy” for lack of a better term, and less earthy/funky Brett-type flavors than expected from the nose. In mid taste something (the hops?) seems to quell the taste, before the spicy black pepper taste emerges and lingers in the dry finish. Interestingly as the beer warms the weird sensation I get in mid-taste goes away and the taste becomes as delicious as the smell promises. It’s a pity that there isn’t much beer left by that point because I am wanting more than a 9-10 oz sample left after the gusher. Moving onto the dry hopped version, the first question is how does it differ from the standard version? According to the bottle this beer is dry hopped with a different variety of hop each year. This year (2013) the hop used is Triskel from Alsace. As this is a new hop to me (and maybe you) so I’ll quote the description of Triskel hops from the bottle. The appearance of the dry hopped beer is quite similar to normal Saison Dupont. This beer is not a gusher but it does have a huge head of white foam like the original. I get a bit sweetness in the nose. It smells like a Belgian Strong Pale Ale. The taste is pretty similar to the original but with a green, fresh hop twist. Interesting and enjoyable the fresh hops don’t clash with the classic flavor profile of Saison Dupont, but I’m not sure they enhance it either. I can see why this beer is such a highly regarded beer. Complex yet drinkable. This is a beer that you have to try at least once in your life (and after you do it probably won’t be the last time). Between the two versions reviewed here I’d probably go for the classic over the dry hopped version.